She teamed with her husband to make her mark at the UW through generosity and service. Dorothy Simpson was one of a kind. She didn’t take “no” for an answer at a time when women weren’t considered full participants in sports, employment or other arenas of public life. Before she married W. Hunter Simpson in 1951, she had traveled the Yukon River in an 18-foot riverboat and she had flown around the world. At age 76, she rode in a Russian MiG 25 to 80,000 feet at Mach 2.4. And four years later, the Guinness Book of Records recognized her as the oldest woman to have experienced weightlessness. Born in Bronxville, N.Y., in 1924 to parents who strongly believed in the value of education, Simpson became a great friend to the UW, where she earned her master’s degree in business administration in 1982. She was a big supporter of the Husky women’s crew program. Her husband, Hunter, earned his bachelor’s degree from the Foster School of Business in 1949. His career at IBM took them all across the country with each promotion. But Seattle was home, and they returned to the Pacific Northwest when Hunter became the president and CEO of Physio-Control Corp., a position he held from 1966 to 1986. The Simpsons’ generosity touched almost every part of the Seattle community, especially the UW. Hunter Simpson served as a UW regent from 1987 to 1993 and was a founding director of the UW Foundation. Dorothy Simpson was especially supportive of UW students and faculty in science and technology, particularly through the Achievement Rewards for College Scientists (ARCS) Foundation, which this year is celebrating its 40th anniversary. 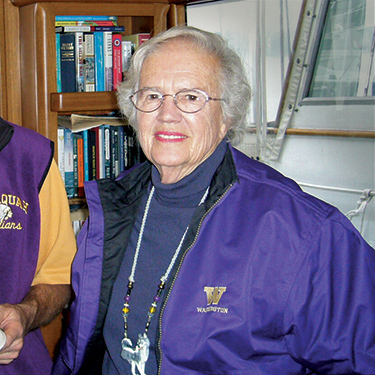 The Simpsons were honored with the University’s first Gates Volunteer Service Award in 2002 to thank them for their 50 years of service to the UW. That award recognizes individuals who give generously through both philanthropy and service, not only shaping the trajectory of the UW, but encouraging others to do the same. Simpson died Feb. 13 in Seattle at age 93.